Hey.. thanks for making me cry at work. okay, now that i’ve had my daily cry…i had to share it with the 248 friends i have on facebook. Great post Carol. I’m very thankful to everyone you mentioned–and YOU TOO for all you’ve done for Ema. Praying that all goes well. I spent Thanksgiving walking with my Frenchies in Edmonton’s River Valley. 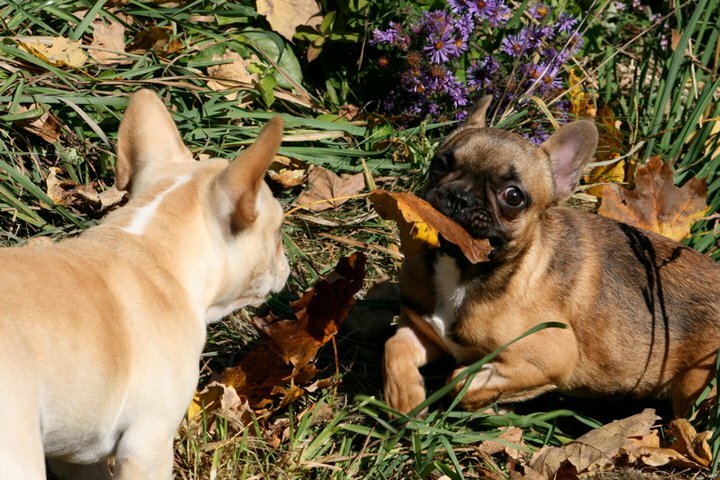 I realized that when I count my blessings, I count my Frenchies twice. She’s a Frenchie – she’d probably just accept as her royal due 😉 They’re not big on modesty, this breed. Delilah still thinks we’re not grateful enough for being allowed to live in HER house. It’s not our Thanksgiving yet, but it’s never the wrong time to be grateful, and we certainly appreciate all you do for the dogs – and this delightful blog you share with us!